The name of this exhibition comes from contributing artist and writer, Luisa Tora. 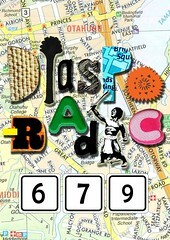 Diasporadic is the title of her hand-made zine, which is published from South Auckland. Read an interview with Luisa Tora on Urban Viti – the excellent arts and culture blog site run by diasporadic679 Brisbane-based artist, Dulcie Stewart. Diasporadic, the zine, was born out of the How To Be A Zine Maker workshop at Fresh Gallery Otara in January 2011 with zine makers, Coco Solid and Riki Anderson. Vinaka vakalevu to Luisa for lending her name to this project.